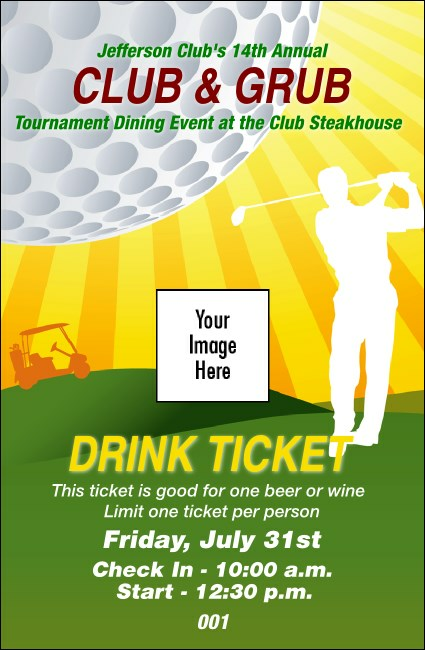 Playing eighteen holes is thirsty work—keep players refreshed with the Golf Backswing Drink Ticket. This cheeky design places a golf ball as the sun and has a glittering green in its background, upon which tournament details sparkle. Upload one custom image and customize nine lines of text. Sized at 2.71" x 4.14"
Up your event organization game with TicketPrinting.com!